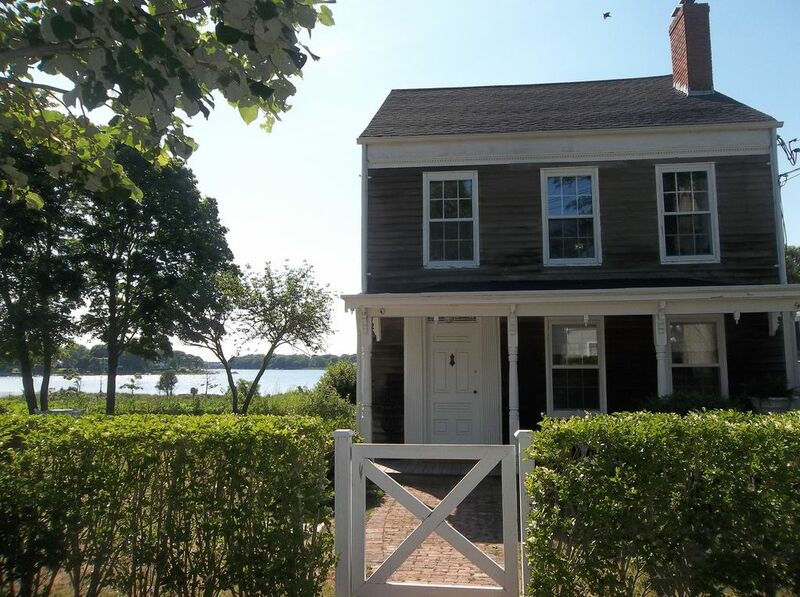 If you do not see the booking availability desired, look at my other postings of Whaling Captain's Pierson's Apartment and Whaling Captain Pierson's Cottage. Or, if your party is larger than one apartment can accommodate consider booking both apartments and the cottage. Whaling Captain Pierson's Apartment Too is on Captain’s Row within the main house. The property is surrounded by nature and the apartment overlooks the cove and has views of Otter pond. Whaling Captain Pierson's Apartment Too is a first floor completely private apartment of which nothing is shared other than the hallway of the main house. Once inside of Whaling Captain Pierson's Apartment Too no one enters or exits but those guests of your party. Whaling Captain Pierson's Apartment Too’s antique furnishings reflect both a classical and whimsical ever evolving sensibility without feeling stuffy or old. The kitchen consists of stainless steel appliances. The kitchen is fully outfitted with plates, silverware, stainless steel pots and pans, cups, saucers, salad bowls, coffee maker, coffee press, food processors, toaster, toaster oven, basic condiments, sugar, sugar substitutes, coffee, etc. The apartment is a two-bedroom apartment which has one queen size bed in the master bedroom and one double size bed in the second bedroom. Additionally, the day bed in the living room is a single bed that can sleep one person. Window AC units will provide cooling during the summer in both bedrooms and cast iron radiators provide heating in the winter. The apartment has a full bathroom with a washer and dryer right off the bathroom. The apartment has a private deck and private sun porch. The apartment guests have welcomed access to the property’s private beach, expansive grounds and parking. Common amenities are TV, Cable TV, and Wireless Internet with laptop friendly workspaces. The Apartment is ideal for allowing privacy to loving couples, the single visitor or the various types of creative and performing artists who are looking for a haven to relax and/or create. Experience the Apartment’s environment or just be part of its inspiring, healing, spirit and soul uplifting surroundings. During the day you may see ducks waddling, bunny rabbits with small white tails scurrying, orange breasted birds frolicking and turtles meander across the lawn. Also, deer can be seen nibbling the grass and white swan(s), ospreys, ducks or seagulls flying around or swimming in Sag Harbor Cove. Guests should feel free to use any of the various chairs, tables or benches situated on the front porch, the front lawn and the grounds. Sag Harbor Cove is where my private beach behind the property is located for water access to sun-bathing, sculling, canoeing or fishing if you rent or buy the equipment from one of the specialty shops in the Village. There are four bicycles on the property for guests use on a first come first serve basis. They can be used to explore more of Sag Harbor and other surrounding areas not within walking distance. Long Wharf beach, Long Beach and Haven’s Beach are 3 public beaches in relative close proximity to the house. Long Wharf beach is in the center of the Village of Sag Harbor within the 7 minutes walking distance from the house. However, the other two beaches are within a comfortable bicycling distance from the house rather than by car. One would need a car’s parking pass obtained from Sag Harbor’s municipal building to be able to take one’s car to the beach for beach parking. Only a limited number of car parking passes are available in the Village per season. Guests can always text, email or call me with any questions, concerns or just for places to go and/or visit during or after their stay. Breakfast, lunch and dinner can be obtained from the Cove Deli which is just across the street from the house/apartment. Sag Harbor is a vibrant year-round village with plenty of activities both cultural and family oriented alike. There is a performing arts theater, gyms and spas, yoga studios, art exhibits, festivals and parades which occur throughout the year. There is also a variety of antique, clothing and novelty shops as well as many restaurants, bars and beaches. Sag Harbor can be reached in 2 hours by car from New York City, the Hampton Jitney or the Long Island Rail Road. The Hampton Jitney stops in the center of the Village of Sag Harbor. The Long Island Rail Road’s Bridgehampton station is 15 minutes to and from the Apartment by taxi or car. There are 3 televisions in the apartment. All Standard Channels, Most Cable Channels and Premium Channels such HBO, ShowTime, STARZ, Cinemax and The Movie Channel. We had a delightful weekend stay in this charming apartment conveniently located in Sag Harbor Village within walking distance of shops and restaurants. The place was clean, tastefully furnished, and comfortable. Paris greeted us upon arrival and made us feel immediately at home. During our first evening, we sat on the deck and savored the beautiful sunset over Sag Harbor Cove. We didn't have much time for cooking, but we enjoyed relaxing in the well-equipped kitchen. Highly recommended! Comfortable, attractively decorated, great location with amazing views. Paris’ apartment was really lovely. Very well located close to Sag Harbor town. The outdoor space was lovely with great views at all times of day. The 2 bedrooms were perfect for me and my husband plus my parents and were really comfortable. Paris had stocked the kitchen and bathroom which was very thoughtful. Paris is a great landlord and host - right from the personal greeting and welcoming bottle of wine! The house is like stepping back in time but with all the modern amenities. The linkage back to England and Russia was special for us. The view of the lake from most windows makes it a beautiful setting and it was an easy walk into town for all the restaurants and shops. Great place to stay in Sag Harbor. Fully equipped, spacious, beautiful apartment close to town with a stunning water (especially at sunset) view. Paris was truly invested in making sure that our stay was pleasant (including the amazing bottle of wine left for us!). Could not have been better and views are amazing! We had an absolutely wonderful time at Paris’s apartment and can’t wait to come back. The apartment is large, well furnished and comfortable. The kitchen is stocked with basic equipment for light cooking, which is great for having a meal out on the patio with the beautiful view. The location can’t be beat (10-15 min walk to town and right on Sag Harbor cove) and the view is out of this world. Perhaps most importantly, the hosts are a breeze to work with and made our stay so lovely. Can’t recommend enough! My son and I were in to celebrate Father’s Day weekend with tickets to the US golf open. We had an absolutely fabulous stay at this wonderfully historic well appointed home. Our host Paris couldn’t have been more accommodating. He also presented us with a nice bottle of French wine to celebrate the weekend. We raised a glass on a nice deck out back overlooking the harbor and enjoyed a beautiful sunset. There great restaurants and shops a short walk away in Sag Harbor. Don’t miss the American Hotel restaurant or LuLus. We spent most of our stay at the Open in Shinecock. Wish we had more time and would love to return and explore locally.